Online Bullying: It Ends With You. A Peacemaking Project by Abigail S.
I care about this issue because people are getting harassed for doing what they love. People should be able to freely do things without the constant fear of someone dragging them and their spirits down. by speaking out in the community and educating people while also aiding young people to help the cause. listening to others and hearing their stories to understand bullying and harassment to better tailor to their needs. We will show courage by speaking out about different social issues past bullying, and go into the specifics such as LGBTQ+ rights, Black Lives Matter, Disabled people, etc. We will collaborate with others by asking for their understanding on bullying and working to reach out to more people. We will also encourage others to join in on our cause by volunteering, advocating for us on social media, and more! By gathering community input and guidance from mentors, I will ask them to assess our work. We will also self-assess by seeing if what we're doing is helping us reach our goals. This project helped us learn more about the world around us and the differences people face. Bullying is not just one issue, its an issue that has multiple root causes and can be different depending on the person. There is not one standard definition for bullying, so learning about other people, listening to their experiences with bullying, and using this to aide our project really helped solidify our injustice. As a result of our project, our community has become more open and inclusive of others. Not only that, they have become more kind, compassionate, and understanding. The main goal of our project is to reduce judgement of others, and we believe we have achieved this. Volunteers, youth involved in our assembly programs, teachers/ adults involved, etc. We learned more about minorities discussed in the comic by asking for viewpoints of people who identified that way. For example, our main character is a non-binary person of color, and decided to do this after a member in our community, who identifies the same way, was being bullied because of their identity. So, by listening to their story and asking questions, we were able to tailor our story around their experiences. We learned that the most important thing you can possibly do to change the world is listen. Not only listen to respond, but listen to understand. The major challenge we overcame was engaging schools to invest into our program. This can be a big challenge because the base of our program relies on youth engagement, which initially comes from these schools inviting us to present there. We overcame this challenge by constantly persevering, reaching out for help through mentors and connections, and learning from others. We encouraged others in designing our project by holding an initial comic book creation event in our community. During the process, we've gained mentorship for those who helped edit, brainstorm, and create other aspects of the project. After completion and implementation of the comic book, hundreds of people have been involved by joining our message by spreading the word at conventions, engaging in our youth programs, and stopping by public events. If someone were to start a peacemaking project, my advice to them would be to utilize your support, mentors, volunteers the best you can. These are extremely helpful tools and their are plenty of people willing to help with your project. Project Update- Comics, Mental Health, and Advocacy. Abigail S. 31 December 1969 19:00 Our first online comic for our monthly comic campaign! This month, were focusing on mental health for #NationalSuicidePreventionMonth. Abigail S. 31 December 1969 19:00 I would appreciate any feedback/ comments on my plan, thank you! Abigail S. 31 December 1969 19:00 Step 1: Have you identified an injustice that you care about? Have you identified if the issue you care about is an injustice or an inconvenience? Injustice: Online Bullying is a serious issue that is only growing, and is affecting the lives of people every single day. This is a huge injustice that happens every single day and is most definitely overlooked compared to physical or verbal bullying. Since the internet is new turf and social media such as Facebook is only a decade old, this is new material we must learn more about and focus on more throughout the years. Step 2: Do you understand the root cause of the injustice you care about? Do you have a compassionate insight that could help you solve your chosen injustice? The root causes of online bullying include ignorance, control or power, anonymity, and revenge. Insight: To Solve the Injustice of Kids and adults being bullied on the internet, we will address the lack of knowledge, by Speaking out in my community and educating people. Specific: We will hold a bullying awareness day by creating community-based comic books tackling online bullying. Measurable: We hope to bring out 100 people to our event, including writers, illustrators, editors, etc. Relevant: This event will promote community awareness as well as new friendships, sponsorships, and more. Time-Bound: This event will be held on April 23rd, 2017 from 12pm-5pm. Food and drinks will be provided. 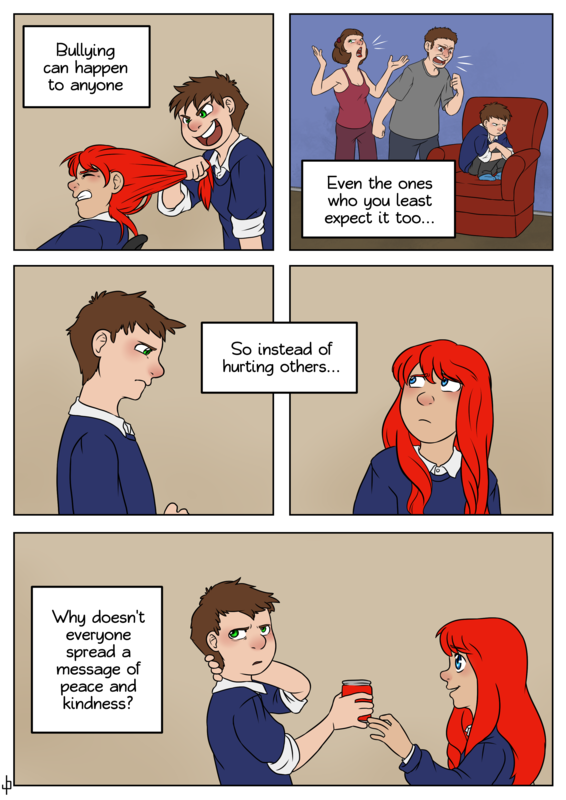 Comic #2- A Comic Strip To End Bullying. 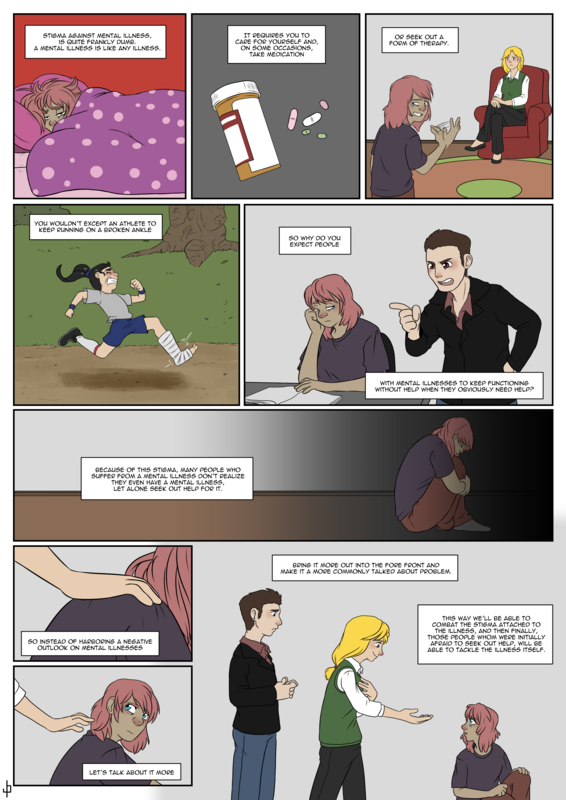 Abigail S. 5 November 2017 10:07 October is National Bullying Prevention Month, and we wanted to create our next comic in the series something that we can all relate to- Bullying. Bullying can be defined as unwanted, aggressive behavior among school aged children that involves a real or perceived power imbalance. The behavior is repeated, or has the potential to be repeated, over time. Both kids who are bullied and who bully others may have serious, lasting problems. 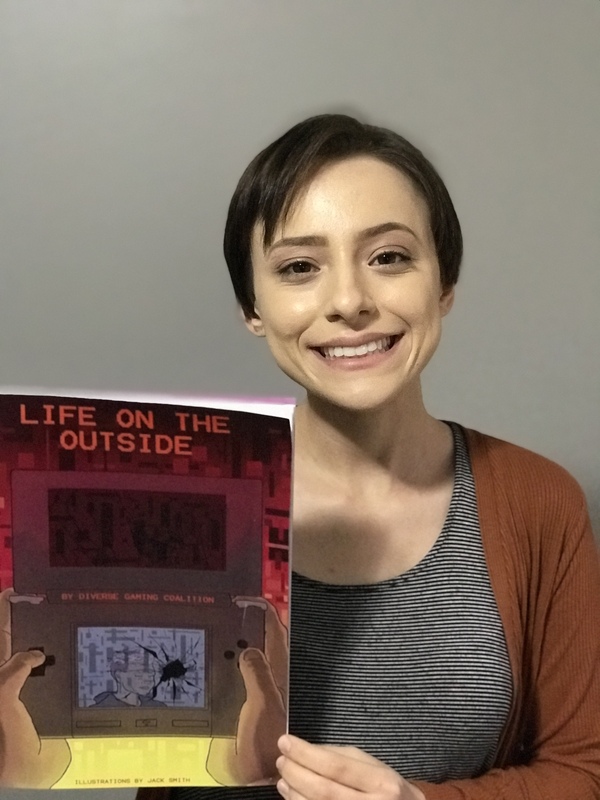 Abigail S. 18 January 2018 16:00 Due to a recent donation from the Fall Out Boy Fund, Diverse Gaming Coalition will be able to print "Life on the Outside" for sale at conventions and for use for educational purposes! -Exhibiting at Pax East 2018 in Boston, MA. With the support from Peace First and other partners, we're hoping to give back to these communities we're present at and give some of our resources away for FREE to those invested in our work in the form of a raffle giveaway. We also hope to document this all through video recording to showcase our impact on the internet. Abigail S. 9 March 2018 17:55 It’s been a long and crazy year, but we have finally finished our project “Life On The Outside”. Pictured here is me holding a PRINTED COPY of the comic!! How crazy is that?? Congratulations on finishing your peacemaking project! I’m on the Peace First team and wanted to say thank you for your amazing work and for taking time to share it with us. Your team's emphasis on reaching out build a more compassionate community is really powerful and I love hearing how thoughtful you've been around that. I am also so impressed with the creative approach - through the power of storytelling. I love how intentional the project is - you've clearly put a lot of thought into how to make this an effective project that incorporates the 3Cs throughout. I'm excited to see where the project goes next! I'd encourage you to think about how to be more specific about the impact you have made. How do you know you have succeeded in reducing judgement? As you fine-tune your story of success, this will help you expand and build more support! Hi Abbey! We're checking in because you haven't submitted your reflection yet. Reflections were due on May 31 as a part of your mini-grant award. Please submit your reflection as soon as you can. We're looking forward to hearing about how your project went! Hi Abbey!! Congratulations! Your project has been selected to receive a mini-grant. We will be in touch soon with details about this payment. As you know, he mini-grant process is also a space for you to get feedback on your peacemaking project. We hope you will use this feedback to further strengthen your project. Please see the feedback on your mini-grant below. I'm excited about the next steps for your project! I think it is great that you are exploring issues beyond bullying -- so many of those issues are deeply interconnected so it is important to take a broad approach. I think your idea to create workshops and events for specific age groups is really great -- I'm curious what your current thinking is for the age ranges you want to work with? It is also great that you have a plan in place for self-assessing your work and getting feedback from the community. I'm really curious to hear more about how you will plan to structure the workshops for each age range. As you implement the workshops, I'd encourage you to think about how you can also get feedback and input from the students (as well as mentors) to help capture how the workshops might shift their perspective. How can you capture the learning from participants? Perhaps you can think of some fun and engaging way to capture their growth or thinking as the workshops come to a close -- potentially using art or having them create something together. Keep up the great work! As always, let me know how we can help. Awesome to see the new comic, Abbey!